Enjoyed throughout the world, tea is as popular now as ever and has more to offer than simple refreshment. Of the three main tea varieties consisting of black, green and oolong, the green tea leaves tout the most polyphenols, which are one of nature's powerful antioxidants. Mint leaves also provide medicinal properties and their refreshing fragrance makes this herb popular for teas, chewing gum and cough remedies. 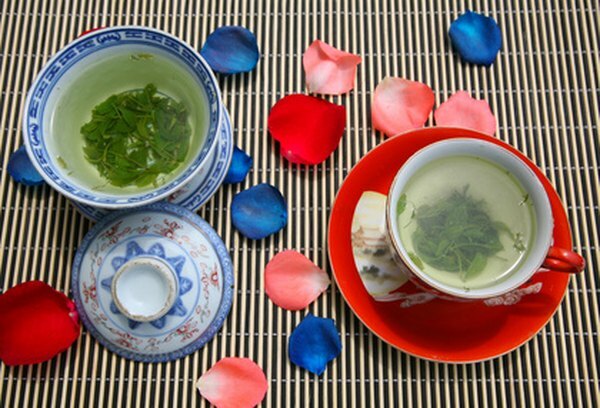 Combining the green tea and mint leaves together creates a delicious, aromatic tea with health benefits. However, you should always check with your doctor before using mint green tea to treat any health condition. Mint green tea packs a powerful punch against bacteria that typically wreak havoc on the teeth. Streptococcus mutans is the bad guy, or usual suspect bacteria on the scene causing cavities, according to registered dietician Nadine Taylor. Peppermint leaves also contain antioxidants and combined with the natural fluoride in greet tea leaves, a cup of mint green tea after a meal eliminates noxious bacteria and leaves your mouth feeling and smelling fresh. A study by the School of Dentistry at Aichi-Gakuin University in Nagoya, Japan, found that green tea had antibacterial and bactericidal actions against many bacteria found in infected tooth roots in need of root canals. Rising your mouth with green tea might also help alleviate pain after molar surgery, a study in the July 2013 issue of "Daru" notes. Smoking cigarettes is not a healthy habit as most people understand, yet many individuals struggle to quit. One effect of smoking cigarettes is the oxidative damage to the DNA of lung tissue, according to an article published in the Oxford Journal. Drinking green tea regularly was shown to significantly benefit smokers by decreasing the oxidative damage to their bodies, according to a 2003 study by the Arizona College of Public Health at the University of Arizona in Tucson. Adding the mint brings more benefits to that cup of green tea, with its throat-soothing qualities and breath-freshening agents. Antioxidants work alongside the body's soldier cells to fight infectious bacteria, viruses and other pollutants, which can make you ill when the immune system becomes overwhelmed. An Italian study in 2005 by the Department of Food Science and Microbiology, University of Milan, found that ingestion of green tea enhanced significantly the antioxidant activity in the blood. Mint green tea provides a cupful of antioxidant power and soothing comfort at the same time. Mint has also been shown to have antioxidants and the added benefit of some anti-allergenic potential, according to a 2006 review by the U.S. Department of Agriculture Human Nutrition Research Center on Aging at Tufts University in Boston. Daru: Effectiveness of Green Tea Mouthwash in Postoperative Pain Control Following Surgical Removal of Impacted Third Molars: Double Blind Randomized Clinical Trial.